The Marcele Bloch MB.152 was a development of an earlier fighter, the MB 151. It was not an outstanding aircraft, but it was better than many of its contemporaries. They fought during the Battle of France with some success, but were pretty much outclassed by the aircraft they came against - most notably the outstanding Messerschmidt BF-109 It had poor performance at combat alitiudes, and very limited range. It did, however, have very powerful armament consisting of two machine guns and two 20mm cannon - the same combination that would show up in other aircraft such as the ME-109E and Mitsubishi Zero. The aircraft also served in very small numbers with the Greek air force against the Italians, and in the Vichy French air force. It was developed further into the MB.155, the subject of another model.. The instructions are reasonably clear, though the warning about test-fitting cockpit pieces coulld have been made earlier (it's mentionedafter the cockpit assembly is completed.) On the plus side, however, it appears that Classic Airframes has finally gotten a new decal manufacturer. These decals have gotten good reviews, unlike the ones in the Defiant I built earlier, which seemed to like nothing more than to crack and fall apart. 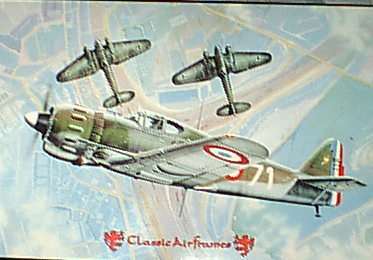 Two schemes are provided - one for an aircraft in the Battle of France, one for a Vichy French aircraft. I'm planning on doing this one in the Battle of France scheme, with the later MB.155 in the (much more colorful with red-and-yellow striped surfaces) Vichy scheme.